Have you ever roamed the men's department at H&M? I definitely recommend it. It is rich with finds, like comfy sweatshirts and letterman jackets, sized extra small. The other day I ambled over to the fitting rooms in the men's section, as the line was (and always seems to be) shorter there. I should add most of the rooms were occupied by women. 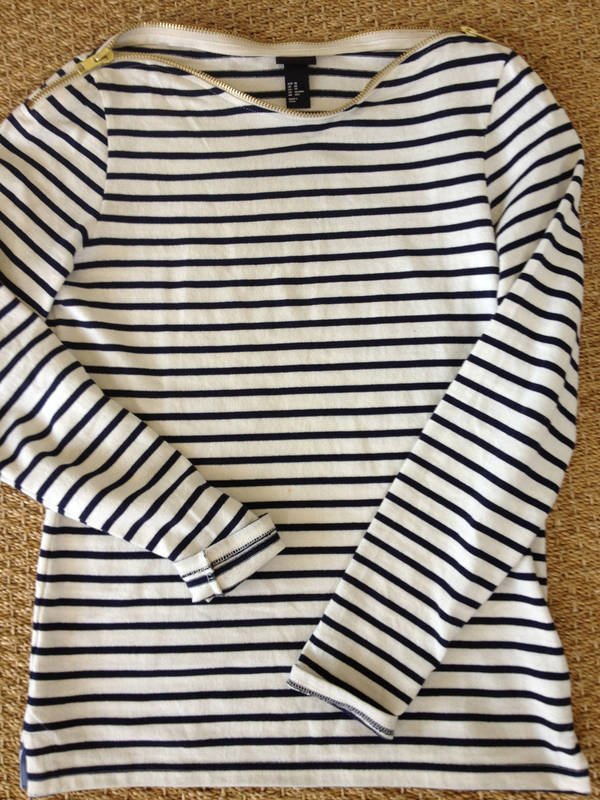 After I finished trying things on, I noticed a striped Breton shirt with a zipper-trimmed neckline on the discard rack. What struck me first was that the top didn't look like it was made by H&M. It looked very designer-ish. Maybe Rag & Bone or Band of Outsiders? I actually wondered whether it belonged to someone else, who had mistakenly left it on the rack. So, I gingerly asked the fitting room attendant if the top belonged to anyone, and if it didn't, if I could try it on. She consented, adding that it was a "men's shirt." No problem, I replied. In fact, it was a total score: the top is so good, its combed cotton fabric thick and plush like an original Saint James nautical shirt, and the cut's perfectly fitting. The neckline's gold zipper detailing, of course, makes it distinctly cool. The price: $34.95. Go and get yourself one before the rest of the girls discover it. I completely agree with you! There's a field of finds in the men's dept! The leather leggings were in store (Beverly Center) as of Saturday. I saw them in oxblood and actually picked up a pair for my grateful sister! Hear hear. When I'm jonesing for a good button-up, I always make a beeline for the men's department regardless of the store. The men's department is a goldmine!! Went in today at the NY 5th Ave flagship. Ran into one of your fellow readers who was looking for the same thing. Unfortunately this store is sold out! GAH!